LatinaLista — Most educators, parents and community leaders feel their job is done when preaching to teen girls the perils of getting pregnant while still in middle and high school. Yet, little thought is given to talking to young women at college. The assumption is that college-age women already know it. Unfortunately, the sad truth is not all college-age women know and much like their younger peers, some still suffer from the same misinformation, myths and wishful thinking. And they’re equally unprepared for what an unintended pregnancy can mean to their dreams for the future. 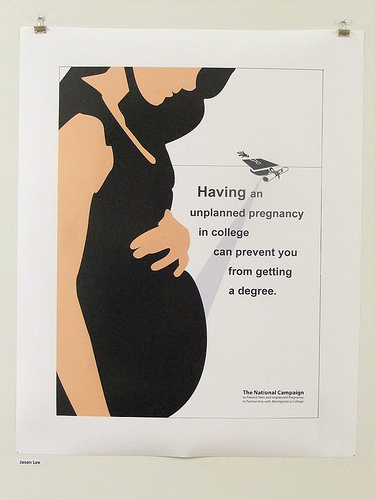 The National Campaign to Prevent Teen and Unplanned Pregnancy noticed that this segment of women was being forgotten when it comes to education about unplanned pregnancies. To get the message out to them, the National Campaign is launching a set of three online lessons, complete with videos, study guides and activities, for college-age women titled Preventing Unplanned Pregnancy and Completing College. The three lessons in Preventing Unplanned Pregnancy and Completing College are designed to help students understand the impact of unplanned pregnancy on their educational goals, their social lives, their significant relationships, and their finances. Students learn about various birth control methods; select the most appropriate method(s) for their values, lifestyles, and relationships; and create an action plan to decrease their chances of unplanned pregnancy. Though the lessons are geared for class instruction, there’s nothing preventing anyone from accessing the online lessons and completing them on their own. The National Campaign says each lesson takes about 30-40 minutes to complete and should ideally be completed in one sitting. At the end of each lesson is a short quiz that gauges whether or not the student understood the lesson’s objective — which in the end is all about finishing school.